Creating attributes and setting a value are probably the primary attribute function used within FME. When an attribute is created its value can be set in any one of a number of ways. 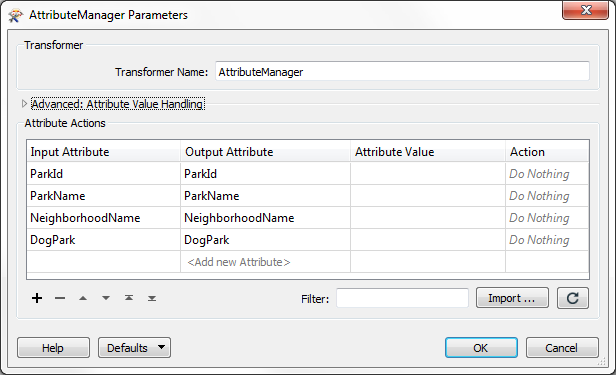 The AttributeCopier and AttributeRenamer transformers can set an attribute value, but only if it exists already. For most operations we&apos;ll concentrate on the AttributeManager, so here is a quick overview of that transformer. The action field can be set by the user, but is also set automatically when a change is made to the other fields. By entering a new attribute name into the Output Attribute field, it will be created in the output. The text <Add new Attribute> highlights where a new attribute can be created. By default, when the Attribute Value field is empty, a new attribute has no value. Here, for example, a new attribute called City is being given a fixed value of Vancouver. However, also note that the existing attribute NeighborhoodName is also being assigned a fixed value. It is being given the value "Kitsilano". Notice how by entering a value into that field, the Action field has automatically changed from "Do Nothing" to "Set Value". Besides entering set values like this, it&apos;s possible to construct an attribute value in a number of different ways.